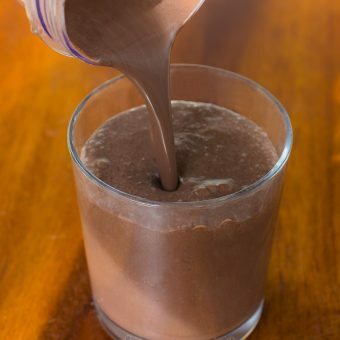 Creamy Blended Frozen Mocha - MUCH less sugar! Frozen coffee drinks are seemingly everywhere these days. From Starbucks, to McDonalds, to Dunkin Donuts, you don’t have to travel far to get your summer coffee beverage fix. It probably comes as no surprise that these frosty coffee drinks are far from healthy; a McDonalds Frappe Mocha packs 560 calories, 70 grams sugar(! ), and an entire day’s worth of saturated fat into just one 16oz glass. And a Starbucks Mocha Frappuccino—weighing in with 360 calories and 54 grams sugar—is hardly much better. 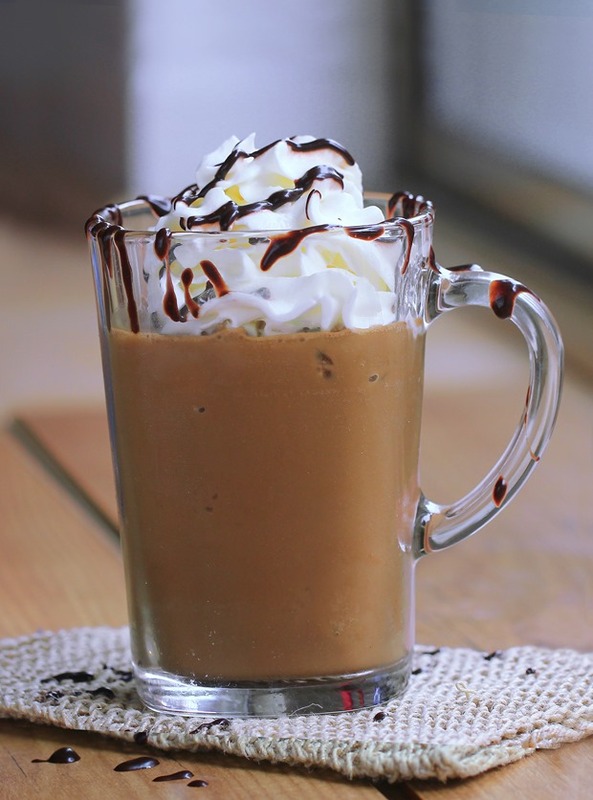 Luckily, recreating these creamy blended mocha beverages at home is extremely easy and will save you hundreds of calories per serving! Topping it with my favorite creamy Healthy Whipped Cream—which has just 6 calories for a heaping 1/3 cup!! !—barely even moves the nutrition stats on this thick and creamy beverage. 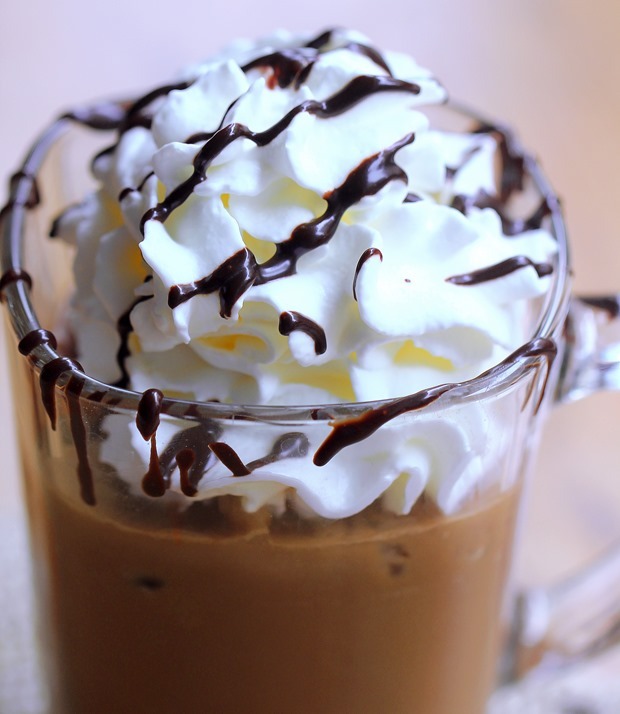 Translation: You can top your creamy frosted mocha drink with a mountain of homemade whipped cream. Let’s be honest, the whipped cream is the best part! 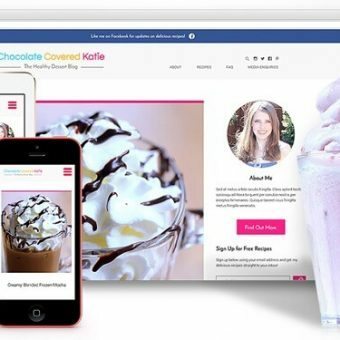 Unrelated: A new design for Chocolate-Covered Katie has been in the works now for almost a year, and I’m crazy excited to finally see the new site go live… some time in the next few days! We’ve been taking your suggestions into account, and if you have any more requests for something you’d like to see in the new site design, now is the time to leave a comment and tell me! Also, the new site will be mobile-friendly. It is way past time! Stir all ingredients together. You want it to taste a little too sweet, as it will taste less sweet once frozen. Sweetener amount will depend on the milk you use, your tastebuds, and the type of sweetener used. 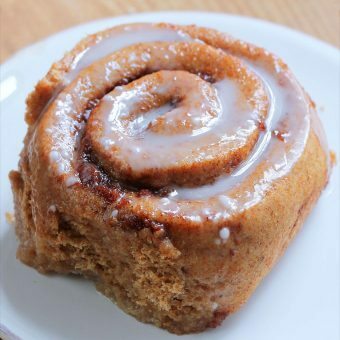 (You can use dates, banana, sugar, maple syrup, etc.) Freeze in an ice cube tray or in a few shallow plastic containers. Once frozen, pop out of the containers and blend on high. If your blender is not very powerful, you might have to let the coffee ice cubes thaw a bit first. 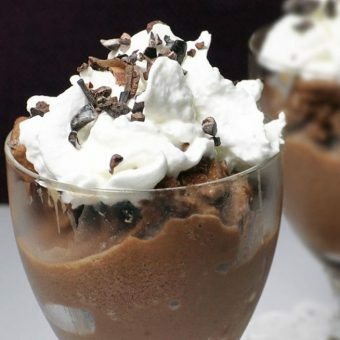 Top with whipped cream (My healthy + dairy-free whipped cream recipe is linked earlier in this post) and chocolate syrup! Once again, please feel free to leave your suggestions for the new site! This is the last opportunity to do so before the new site is finished and unveiled in the next few days! 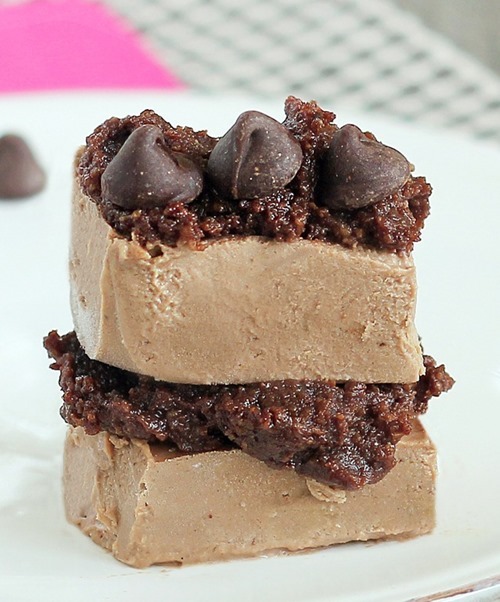 Please add the YUM button for adding your recipe to our collections!!!! Not sure what that is, but I will ask my web designer about it. omg….this doesn´t look good…it looks INSANELY good Katie!!! Looks delicious! I can’t want for the new site! 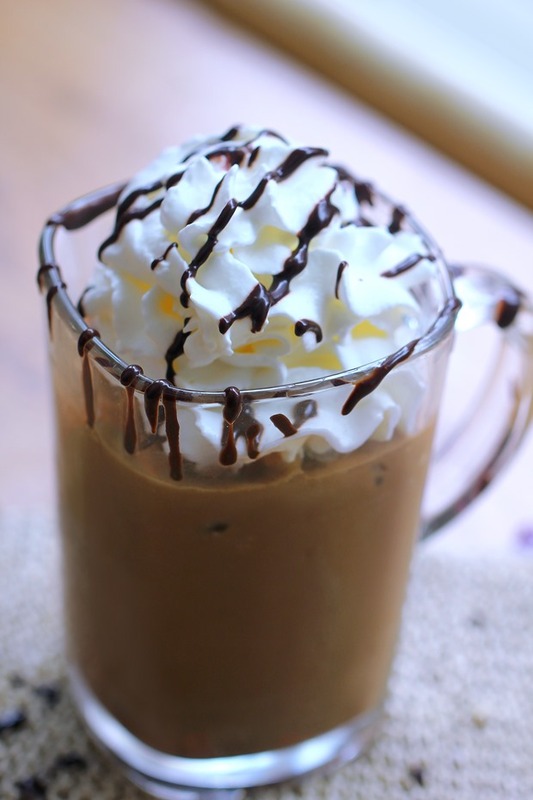 As a fellow coffee addict, I am in LOVE with this recipe! 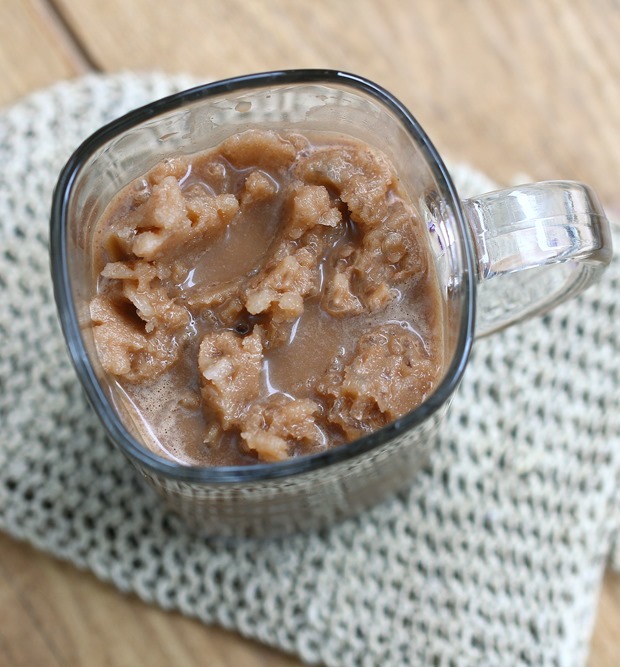 What a great trick for homemade coffee drinks- freezing the coffee instead of adding ice! I’m going to pour my leftover coffee into ice cube trays tomorrow morning. Your coconut whipped cream has been a longtime favorite around here, too. Can’t wait for my healthy frappucino. You seriously always have the best recipes! This looks super yummy!! A search function would be so helpful on your website! This looks so good. My parents are obsessed with both Starbucks and McDonald’s frappes. I’m definitely going to have to show them this. Would I sub 2 tbsp maple syrup for the sugar? Yes, but *up* to 2 tbsp. It will be less if you use a milk that is sweetened or if your tastebuds like things less sweet. OMG, I could drink this so hard right now! Looks so good. And can’t to see the new design! Hi Katie! I just wanted to say thank you for all that you do to post these delicious recipes. This is my first time posting on the blog and I wanted to let you know that your recipes were a life saver when I was going through some serious blood sugar problems and needed some sugar free vegan food (breakfast and desserts) and was getting tired of the same old thing over and over… I was very limited in what I could eat at the time. But I’ve been following your blog ever since and it’s inspired me to be creative in the kitchen myself. Now, as for the suggestions for the new site, I would like (if it’s possible) a way to search by ingredient. There’s not always a “tag” for what I’m looking for and I don’t always remember how to look up by that and most new readers probably wouldn’t know how to search by tag. The search feature on the site doesn’t always come up with just relevant posts related to the search term (for instance, if I search for a term and even instances where that term is only included in the link of the day or mentioned in the post, but not actually part of the recipe clutters up the search). Also, I love being able to see a pic with the recipe listings, but there are times when I’m searching for something specific and a recipe listing without pics so that more could fit on the page would be extremely helpful. I don’t always like going page by page a few recipes at a time looking for what I want. So, a link to a list of recipe links for all your recipes would be nice (and it would be easily searchable by ctrl+f). Most recipe sites have something like this. And one last thing, which I know may not be something you’re considering, but there’s been links at the bottom of your posts that takes us offsite to listings of recipes for various sites that most of the recipes don’t seem to be vegan friendly. I feel like, as a vegan, while we shouldn’t be judging or attacking others for their choices, it is counterproductive to direct others to animal products. I know you have your reasons for it, but that’s just my two cents on the matter. Anyways, thank you again for all you do and I’m sorry for the really long post… I just wanted to make sure I was making sense in how I described things. The ads are done through my ad network. I actually have a very good reason for deciding to leave them up that helps veganism, and if you want to know more please feel free to email me! Thanks for the tip for the ingredient search! I will definitely check it out later. I figured that having your recipes up on that network probably brings in non-vegans to your site. But it’s just unexpected to start seeing meat burgers and the like when visiting a vegan website. Anyways, thanks for all you do. I hope you keep the pretty pic of you on the page… your smile always brightens my day! May seem very minor, but I always thought that it was odd the the category for ‘healthy meal ideas’ was amongst the rest of the cakes and cookies etc. It might be better when it is just after them perhaps? Otherwise, should be good! Wow, this looks so delicious!!! I was just surfing pinterest this morning and was unable to find anything that looked delicious and was (relatively) healthy 😉 This is perfect! I love your site and have a request for your updated site. Can you add in a serving size recipe calculator option for each recipe. Your recipes are often formulated for one serving and I often want to make them for a family of 5. A recipe calculator would automatically transfer the proper serving amounts for whatever multiplied serving size a viewer wants.